I have finally arrived back in Indiana after being gone for about two months. I spent about a month and a half in Wyoming then spent the next three weeks in California, Utah, and Colorado. There were countless bird highlights including Heerman's Gull, Chestnut-backed Chickadee, Mountain Quail, and White-headed Woodpecker. Of course there were many more species, I had about 200 species after leaving Wyoming, but way to many to mention. You were gone from home a long time. I bet it is nice to be home. Your watery shots are beautiful! I love how the detail is more pronounced in the second one. Beautiful shots. I can't believe that I've never been to Yosemite. Great shots, Eric! 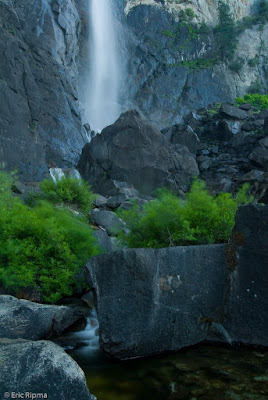 I've seen the Bridal Veil Falls in NC, maybe I can get to the one in Yosemite some day. Beautiful shot of the falls. Hoped you enjoyed your visit to the state of Cali. The second is an absolute beauty! And so is the first - you've just made the monochrome work really well. 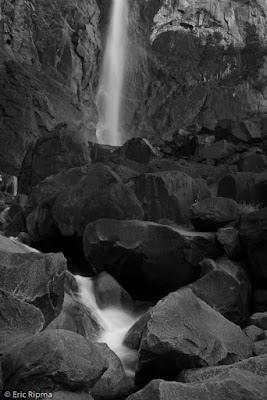 Beautiful shots, love the foamy whites of the falls. Both beautiful shots and your grouse below is a nice sneak up on photo as well. Great photo of beautiful falls. What a wonderful trip that must have been. It is a beautiful area to spend so much time in. Great photos! Nice shots and it looks perfect in monochrome. such a beautiful shot of waterfalls. i love waterfalls so much, i had climb mountains back in 2003 just to get to waterfalls. i miss mountain climbing now.